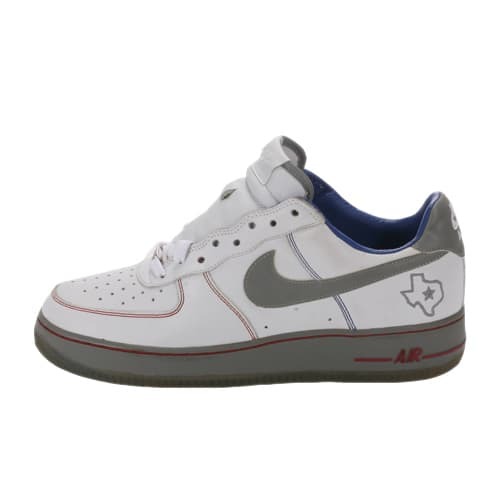 Nike Air Force 1 "Houston All-Star (White)"
"These are the ones I thought I was getting when I bought the other Houston All-Stars (the O.G. Astros colorway). The white ones were hard, and these were like the first Air Forces to have a gray midsole, ice bottom and 'NASA' on the bottom of the sole. These are the pair that Clark Kent had on during the Air Force documentary talking 'bout, 'Rappers don't have this one.' It had a gray midsole, 3M swoosh, blue back, Texas on the side, and the contrast stitching on the front. It was dumb light, too. I got two pairs of these."